Architecture firm Gensler has released designs for SFO's Terminal 2, the airport's original international terminal, now better known as the "Ghost Terminal." An increase in air traffic has prompted the airport to revamp the terminal, which was closed back in 2000. 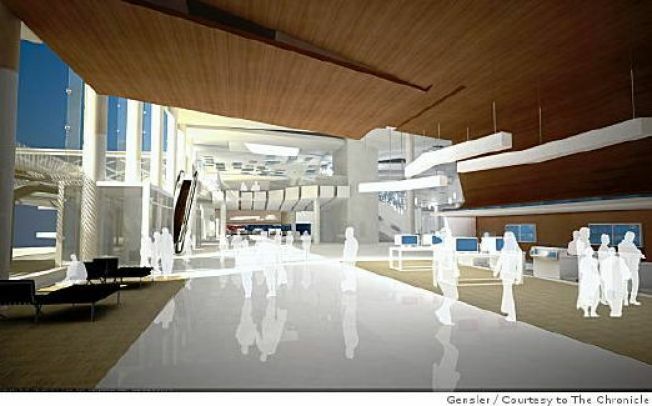 "Relaxation" is the conceptual cornerstone of this $383 million overhaul. Picture a hangar-sized apartment straight out of Dwell. Faux-wood paneling and lots of light are part of a scheme designed to calm passengers. A spa for stressed out travelers is also part of the plan, as is a "passenger recomposure" area— ostensibly for belt re-buckling and general restoration of personal dignity. Expect almost 50,000 square feet of retail and food. In a final moment of irony, all efforts will be made to serve "slow food" to frazzled passengers. With air travel as it is, we say kudos to Gensler for, at the very least, making us laugh. ETA: 2010.